The Bonfire Women’s Jasper Jacket would be a good choice for the person looking for a lower price point jacket that is gonna keep you warm. There’s ample insulation in the body, arms, and hood of the jacket that would be good in those cold temps. The cut is a little shorter than I would prefer but if you are a smaller frame then maybe it would work better for you. The hood fit ok, it was a little constricting, but would do a good job for the cold windy chairlift ride. Fit: Normal, a little on the shorter side. Hood: Contoured attached hood, was a little restricting when turning my head but had a great seal between the collar and goggles. Insulation/Warmth: Felt like it would be a toasty jacket. Ample insulation in the body and sleeves. Overall: Would be a good choice if you are looking for a nice warm jacket on a budget. It has 15k waterproofing so you could get by in most storms but just wouldn’t be ideal in a really wet climate. 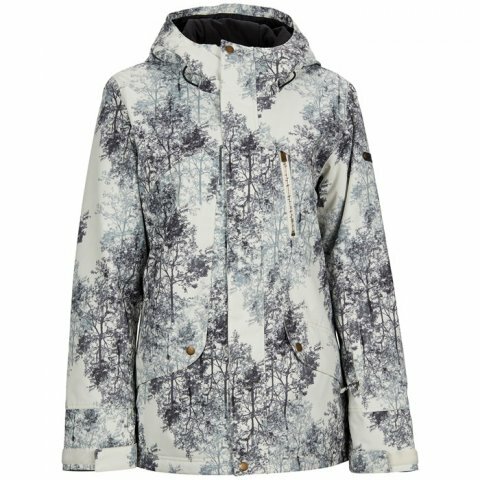 It has all the features of a good snowboarding jacket as well, powder skirt, ample pockets, and wrist gators. We try to get as many images of the Bonfire Jasper Womens Jacket, but forgive us if they're not all there.